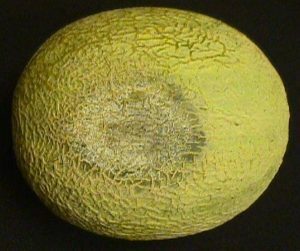 The roots, crowns, stems, and fruits of melon are susceptible to Phytophthora capsici. P. capsici is favored by rain and warm temperatures and spreads rapidly via water, including irrigation and surface water sources. The pathogen can overwinter in the soil and spores can persist in infested soil for as long as 10 years. Phytophthora also affects squash and cucumber.